Welcome to our Partnership Programme. Where even little things can turn into big, big savings. We believe in treating our customers like the stars they are. So here’s a new way of showing our appreciation: extra savings every time you buy on your account. 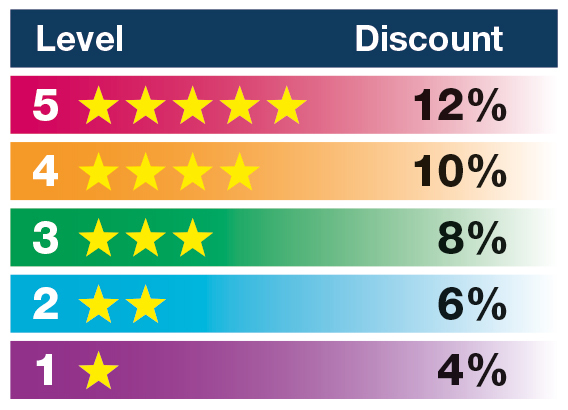 As you can see, there are five target levels, with the opportunity to earn a significant 12% discount in the 5 Star level. Shop. Save money. Repeat. Save more. Every time you buy something, whether big or small, whatever you spend will be added to your Partnership Programme summary. You’ll start the year with a discount level based on your previous spending. Then, every month, we’ll check your account and let you know your current level, your projected level based on your current spending patterns, how much you’ve saved so far and if you go up a level (you can also find this information any time you log into your web account). At the end of the calendar year, if you’ve moved up one or more levels, we’ll give you a rebate calculated on the extra discount you earned. You’ll get this rebate in the form of a reward voucher which you can redeem online at our checkout. So to turn even little things into big, big savings, just keep on purchasing your education supplies with us. If you’d like to know how we can help you maximise your discount (and, of course, your savings), just get in touch with your account manager or phone our Contact Centre who’ll put you in touch with them. Reward vouchers are only valid for the period stated on the reward voucher. Reward vouchers hold no other value than that stated for the period shown. Reward vouchers are void past their stated period of validation.